How much do I adore Ruby Oliver?! After reading The Boyfriend List earlier in the year (and loving it! ), and hearing about upcoming fourth book in the Ruby Oliver series, I was absolutely desperate to read The Boy Book sooner rather than later. And again, I loved it. In this, Ruby is still a sort of pariah at Tate Academy. All of her old friends still aren't speaking to her after the events from The Boyfriend List. As she begins her junior year, she's still friends with Meghan, she's still seeing Dr. Z (though she hadn't had any panic attacks in ages). Missing her friends, Roo pulls out the old Boy Book, the one that she used to write in with Kim and Cricket and Nora and she tries to move on with her life. She makes friends with Nora again and gets a job at the zoo. She's really enjoying getting to know Noel more and hanging out. There may even be some kissing going with Angelo of the big lips :) But most confusing of all, are the notes that start appearing from Jackson now that Kim is away in Japan. Now what does Jackson mean by doing that? Ruby goes through some difficult stuff in The Boy Book. Patching up old friendships, deciding what she wants out of her relationships with Angelo and Noel and Jackson. Moving on from the decisions that she's made in the past and moving forward. Without therapy? As always, Roo is such a fantastic character. She's so quirky and fun and I can't help but have a bit of a crush on her. 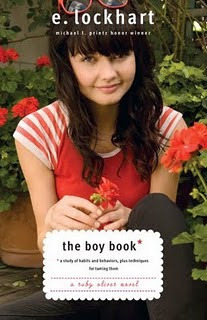 The book is filled with excerpts from The Boy Book about her and her friends amusing experience with boys, and the smile-inducing footnotes regarding popular culture. Everything feels realistic and as Roo struggles with everything going on in her life, the readers struggles right along with her. Having an interest in psychology, I absolutely adored Roo's therapy sessions with Dr. Z and the way in which Roo is trying to become more self-aware and really think about the decisions and actions that she makes. This is a very fun sequel in a series that's not to miss! I really like this series. It's so funny! This is the first time I have heard about the series, must get my YA radar fixed! Vivienne - OOh, then you're in for a treat, as the series is sooo wonderful. The first book in the series is The Boyfriend List. You might have seen the cover with the frog? Maybe? Yay I love this series so much, they're so awesome. I haven't read the latest two installments actually so I must get a copy of those! I love Roo! Thanks for the great review. CarlyB - I haven't read the last two either! I really, really must! Luisa - Roo is wonderful, isn't she? Feisty and fun and funny.